I have never known Marc as a criminal. I have only known him as the largest and funniest member of my family. As a child, I saw this tattooed arm over and over again. It appeared at family cookouts turning a lechón (roasted pig) in its fifth hour, it held me steady on Marc’s broad lap, and it was revealed during the wintertime, when our pipes would hiss until the relentless heat would force us all to roll our sleeves as far up as they would go. I remember reading his tattoo each time I saw it, trying to understand what it meant: Only God Can Judge Me. Innocence, in its mercy, partly excuses us from having to fully reckon with the spiritual gifts of forgiveness, grace and redemption at the heart of the Catechism: I believe in the forgiveness of sins. Marc—like several men in my family—had been caught in the webbed threads of poverty, geography and lack of opportunity during the fever pitch of 1990s mass incarceration. Baggy-pant boys like him fit the descriptions of “super-predators” and “thugs” that dominated our national discourse at the time. Marc served his time, and has been out of the system ever since—a miraculous feat, given that over 75 percent of released state prisoners in the United States are rearrested within five years. Today he is a union worker and a happily married father of three successful children. Innocence, in its mercy, partly excuses us from having to fully reckon with the spiritual gifts of forgiveness, grace and redemption at the heart of the Catechism: I believe in the forgiveness of sins. The still imprisoned are not so lucky. By virtually every measure, the United States incarcerates more of its people than any other nation in the world. When we look at the fuller picture of who we imprison, for how long and why, it may not be a stretch to conclude that our criminal justice system could very well benefit from a rite of penance of its own. There is overwhelming evidence that mass incarceration evolved as an outgrowth of Jim Crow laws, which itself was a system rooted in the subjugation of former slaves. According to legal scholar Michelle Alexander, there are more African-Americans under correctional control today than were enslaved in 1850—that is, before the Civil War. When it comes to Latinos, the numbers are more confusing. While 40 states track race in their arrest records, only 15 states in the nation track ethnicity. This means that most states have little to no data on Latinos in the criminal justice system. We must also look at what imprisonment entails. Criminal justice reform must take into consideration factors including increasingly punitive Immigration and Customs Enforcement operations and the black-box detainment of immigrants and separated families; the ethics of solitary confinement; parole and probation; protecting due process; and the effects of incarceration on motherhood and mental health. What should be the ultimate goal of sentencing and incarceration? Is it punishment? Rehabilitation? Forgiveness? For Catholics, these questions tie directly to the heart of our faith. Wow! Congratulations Alexandria. You're in my district. Though I like Crowley, I wanted you to win. I convinced my husband too, to vote for you. Perhaps the whole Trump victory was the last hurrah of right wing Republican nationalism. It's time "socialism" is no longer a dirty word; its time to join the rest of the advanced democracies and recognize that the role of government IS to provide for the welfare of all the citizens. May the peace of Christ be with you Ms. Alexandria Ocasio- Cortez. Did you know she was pro choice...execution for the innocent? See her full platform at her website. I did. Another reason why I voted for her. Letting a woman choose. Unless, you don't think women can make their own choices and decisions about their own bodies and lives? Decisions about their own bodies yes...about a preborn’s body no. Freedom to kill is what those 7 Trinitarios gangmembers had last week against a totally innocent boy. They “aborted” stabbed ( no head crushing like the preborn) a body that was distinct from their bodies...same as abortion...the ending of a person within you. You think as you do because the clergy hasn’t mention hell since a century ago....and that was to say maybe it’s empty. Christ in Luke said...” many will seek to enter on that day and they will not be able.”....in another place....” take heed that the light that is in you is not darkness”. As a woman and a Catholic, I am happy to say that no, you don't get to support abortion and still call yourself a Catholic in good standing. So I would hope that, if you have decided abortion is a right, you aren't falsely claiming to be Catholic. Abortion is not a right, nor is it a political issue. One cannot be in communion with Christ and His One, Holy, Catholic, and Apostolic Church, if one denies The Sanctity Of human life from the moment of conception, and the Sanctity of marriage as Defined by God. “It is not possible to have Sacramental Communion without Ecclesial Communion”, thus a Baptized Catholic must remain in communion with Christ, and His One, Holy, Catholic, and Apostolic Church, outside which, there is no Salvation. God, The Most Holy And Undivided Blessed Trinity, Is The Author of Love, of Life, and of Marriage, not Caesar, John Locke, or King John. It is not possible to “fully reckon with the spiritual gifts of forgiveness, grace and redemption at the heart of the Catechism”, or “believe in the forgiveness of sins”, if one denies The Christ, and thus “The One Lamb Of God Who Taketh Away The Sins Of The World”. It Is Through, With, And In Christ, In The Unity Of The Holy Ghost (Filioque), that Holy Mother Church exists. So, in other words, you ignore the clear teaching of the Church that abortion is a mortal sin and an "unspeakable act"? I'm curious: if you can ignore the Church's absolutely crystal clear teaching about the inviolability of the human person, what makes you Catholic at all? William Bannon - This one-issue viewpoint, a flat rejection of a politician because "she's pro-choice", is less than useless. One-issue voters on the matter of abortion have given us a corrupt and incompetent president who is a threat to democracy. The "pro-life" advice seems to be "Vote for any criminal who promises to ban abortion." The reality is that the majority of Americans are pro-choice. Being flatly against choice in reproduction is fatal for a politician, with the possible exception of some of the southern and midwestern states. A secondary problem for those in the pro-life movement is that some "pro-life" people want not only to ban abortion but also contraception. Ninety percent of Catholic women currently use contraception (99% have used it at some point in their lives), so a movement that threatens access to contraception is going to be unsatisfactory to the vast majority of the population. You can continue your one-note song about "she's pro-choice" but few are interested in hearing it. I'd like to think I would have been a one-issue voter on slavery. Wouldn't you admire a one-issue voter on slavery? How about a one-issue voter on Jim Crow? People should read "Suicide of the West" by Jonah Goldberg to understand why socialism can never work. It's contrary to the natural law and how God made us because it stifles individual freedom and initiative. Is an article about socialism by Elizabeth Breunig and all it's wonders not far behind (past America author who has written on socialism)? What exactly do you mean by socialism as opposed to social democracy, which works quite well in northern Europe? Socialism means the ownership of the meanas of production by the government, a ssytem that does not work. Social democracy means private ownership of the emans of production, with the government taxling and regulating to ensure that every one benefits from the economy. Even in the USA we have had successful regulation of industries - transportation worked much beter when it was highly regulated, so too for HMOs before they were sold of their boards at a chep pricee and sold for an enormous increase, with much higher health care costs resulting. And the airwaves worked far better under the rescinded fairness rule. Don't spread lies about social democracy. It works, resulting in societies where owners make good profits, workers make good wage, and happiness and environmental health is much higher as well as upward mobility. In the USA the word socialism is iused too loosely, sue for real socvialism and social democracy, a system far different from real socialism. All the attacks in the US against socialism are designed to close of any consideration of social demmocracy.They are biased propaganada. Two things: first, the term socialism was used. The author is not a social democrat but a democratic socialist. It's not quite clear what the difference between a democratic socialist and a socialist is. The author wants to make much of life free. Who will pay for it is not clear. There is no example in the world where this is happening. Second: the Scandinavian countries are free market democracies that are very small and very homogeneous and have high taxes. They could never be used as an example to emulate. Sweden in particular is having problems currently with their welfare state approach. People should never read any Jonah Goldberg for any reason other than mockery. Problem with your comment is that I have read Jonah Goldberg and know your comment is nonsense. He is an amazingly insightful researcher and a gifted writer. Don't agree with everything but one can learn a ton from his books and columns. The average person will learn a lot from reading him. Wow! On the 50th anniversary of Humanae Vitae we're celebrating abortion and birth control as well as communism. I've never heard of America magazine till now, but I can see that this publication is clearly at odds with Church teaching and every true and learned Catholic should avoid it. Just another run-of-the-mill liberal publication exploiting the 'Catholic' label to indoctrinate the unwitting masses. Catholic News/News Agency, EWTN are far better resources for Catholic news and faith formation. JP2 left a strong legacy for us. Let's not destroy it with this nonsense. Alexandria, congratulations. Please speak up for the most innocent, the unborn. This will definitely attract all Catholics. Yes she is, pro choice and pro abortion are NOT the same thing. But we don’t know whether a pro choice person is also pro abortion...maybe only her friends know. But we do know that available legal abortion ( pro choice ) sets up a culture over time that makes far more preborn killings probable among especially the poor even if it physically saves a smaller number of women. One country now aborts almost every mongoloid pre born e.g. The affluent will travel....might even prefer it. Catholics don't have a right to impose their religious values on American government- that clearly goes against he separation of Church and state. As a woman, I believe that ever woman has the absolute right to decide over her body, and no government should be allowed to interfere with her right to bodily autonomy. I guess that makes me 'pro-choice. Abortions will never be eliminated, all that would happen if that were the case, that abortions would no longer be safe..besides, almost three quarters of Americans, esp here on the East Coast, believe that abortion should remain legal. Pro life and pro choice are not the same because it is not possible to be Pro life if one condones the choice for oneself or someone else, to abort the life of a son or daughter residing in their mother’s womb. Fine. If she's pro choice but not pro abortion, I expect to hear her speaking frequently about how harmful and immortal abortion is, how she completely supports programs to help those in crisis pregnancies, and how good people should do everything possible to encourage those who are pregnant to uphold human life. Do you really expect to hear these things from her? Don't hold your breath. Jean, if you are pro-choice and and one of the choices is abortion then you are pro-abortion. Great essay! This is a model for essays by politicians in AMERICA. (Leave inside-the Beltway analysis to other venues.) The final sentence from Matthew 25--one of the most radical assertions in human history--is especially appropriate. But not when misquoted. To visit someone in prison says visit, that is all. If someone believes in social engineering this is fine but don't use Scripture as a necessary source statement on the issue. As for your parsing of Matthew 25, the truly radical part is that Jesus identifies himself with the poor, hungry, imprisoned, et al. I got my first look at the new candidate on Democracy Now this morning. She's got the right stuff and I hope to see her in congress next year. I have Marino. Ugh. I have followed your campaign from Oakland. I wish that I could vote for you. I am grateful that you aim to live a faith that does justice, and am glad America provides this space for your testimony. Now we have to insist on the reform of the Catholic Code of Canon law, specifically the revision of canon 1024: "A baptized male alone receives sacred ordination validly." This canon is a projection of patriarchal gender ideology, and is an artificial contraceptive and abortifacient of female priestly vocations. We are not fully pro-life yet! As I have noted previously, I am a Catholic Deacon with 40+ years in criminal justice. I have been involved in correctional ministry for 15 years. Like our author, I believe the criminal justice system needs to be updated. We all want the best for people. How we accomplish that can be debated. I prefer an approach based on rewards for personal responsibility. I came from a “less than perfect background” and could easily have become incarcerated, but moral values and personal bounderies kept me from making too many mistakes. I hope the author is equally passionate about children yet to be born, the security of our most vulnerable and having the means to fund programs that are not just rhetorical but substantive. I understand. I was trying to be diplomatic and submit comments that would make the author or someone else think about the totality of her views. Actually, I'm extremely disappointed in America Magazine and the Jesuits in general. It seems there has been a strong shift away from traditional values, morals, and traditional catechetical teachings of the church for some time. America has become just another left leaning magazine. The fact that the magazine ran the story authored by her is in and of itself an endorsement of her and her overall views - plain and simple. Yes....but it’s bigger than they are ( I had them for 8 years)...it ultimately has to do with modern biblical scholarship’s tendency to not believe passages unless they are sweet or near sweet. Read Benedict in Verbum Domini sect.42 wherein he says the massacres of the OT were sins. They weren’t. God alone though can order one because He alone knows the condition of each person’s soul prior to and during such an event...and on His part, they were a last resort as Wisdom chapter 12 reveals. John Paul II likewise demeaned passages that he did not like...see sect. 40 of Evangelium Vitae wherein he denigrates the Pentateuchal death penalties given by God as though they were false projections by the Jews onto God. Over sweetness is pandemic...in sermons...in biblical commentary...and it ain’t gonna change for maybe a century going forward....Plato...men become feminized in certain areas if they overdo culture and underdo the physical....Republic Book III....most clergy in the West. Two things: First, Incarceration rates are highly associated with growing up in a fatherless household. While it may be useful to examine the effect of slavery/Jim Crow laws, it was well after these had disappeared that black fatherless homes became the norm with increased incarceration rates. What are the cause of fatherless homes? Second, The Trump administration is looking into changing the sentencing guidelines. It might be worthwhile forming a bi-partisan committee to pursue this. "What are the cause of fatherless homes?" Perhaps "fatherless homes became the norm with increased incarceration rates." Why don't you do the research? Clue, rise in fatherless homes came first. Scientific data analysis shows that the main cause of high incarceration for minorities and the poor is due to the corruption of the plea bargain system. Even the innocent plea bargain rather than face likely conviction and ridiculously long prison terms (for minorities). Correlation does not say anything about cause. And many fatherless homes are caused precisely by needlessly high incarceration rates and needlessly long sentences. Do the research. Who is responsible for most violent crime in the US? Why did it change after fathers disappeared from the household. What caused the child without marriage phenomenon. Why was black illegitimacy the same as whites 80 years ago. What changed that? It wasn't slavery or Jim Crow laws. It was due to the founder of Ms. Ocasio-Cortez's political party, Michael Harrington who was designer of President Johnson's War on Poverty/Great Society. That is God saying wrath not rehab is sometimes called for. That passage was never cited by any of the last three Popes. It was given by God within the Roman Empire which had unjustly executed Christ and John the Baptist and James.....and it had inescapable life sentences in the mines. From Brazil north and across and up thru Central America into Mexico...there is no operative death penalty....and it has the highest murder rate as a region in the world. China has more poor than that whole region and has only 11 K murders a year. Brazil alone has 55K with one seventh of China’s population. If Brazil had China’s murder rate, she would save over 50,000 murder victims a year. Research world murder rates. Affluence stops murders in Europe but execution stops murders everywhere the poor are in the hundreds of millions if there are sufficient police to even arrest them. Guatemala convicts only 4% of murderers due to insufficient policing. Unfortunately Alexandria is pro-abortion according to her campaign website. Too bad, such a well written article but apparently selective in choosing who deserves justice, prisoners yes, unborn no. Congratulations! I watched you today on Morning Joe. I'm very glad to see you support women's reproductive rights - I think that's one issue we Democrats have to stand fast on, including Catholic Democrats. Why don’t you learn how to do abortions so you can crush the heads of preborns and then realize the reality instead of the anasthesia that prevents realization. Please Alexandria, reconsider your pro choice stand. You can be progressive and against abortion. Please consider that the unborn are already living humans; the fetus is already a living human being capable of feeling pain. People know this, and many who would otherwise be open to progressive policies, are turned off by the dishonesty of not recognizing the unborn as beings, and the callousness of supporting the killing up to term of sentient capable of suffering, unborn humans. It's hard to tell, given many of the comments here, that polls show that the majority of Catholics are pro-choice and for keeping abortion legal. 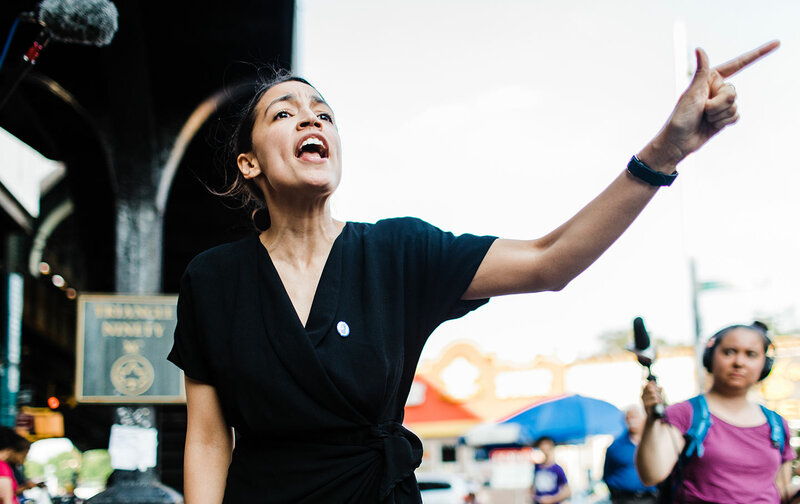 Alexandria Ocasio-Cortez is the Democratic nominee in New York's 14th congressional district. Her opponent in November will be Republican Anthony Pappas.